Egypt’s northeast border, still the most sensitive of Egypt’s border zones, derives its peculiarity not only because of its connection with armed conflict but also because much of the smuggling activities across other borders are aimed at supporting terrorist activity in the northeast corner of Sinai. The northeast border became the locus of an unprecedented level of terrorist activity against the backdrop of a period of protracted instability that enabled terrorist groups to amass in Sinai in the vicinity of Israel/Gaza, a situation aggravated by Hamas’s control over Gaza. The latter has rendered the question of the Egyptian-Gaza border particularly complex because of how Sinai had become linked, economically in particular, to Gaza. The people of North Sinai became increasingly economically dependent on Gaza following the collapse of the conventional economy in the Strip and the growth of illicit trade through cross-border tunnels. The phenomenon proliferated after Sinai became a huge arms market and strategic corridor for arms smuggling to Hamas. Following the overthrow of former president Mohamed Morsi, hostility mounted between Egypt and Hamas-controlled Gaza as jihadist Salafist groups in Sinai grew increasingly active. A significant turning point occurred in November 2014 when Ansar Beit Al-Maqdis declared allegiance to ISIS and renamed itself the Sinai Province. Hamas, as a means to counter the pressure on it, tacitly allowed some of its members to collaborate with ISIS’s Sinai franchise. The latter helped transport arms from Iran and Libya through Sinai to Hamas, and in return took a cut in the form of large quantities of weapons from each freight load. This was how Sinai Province obtained quantities of Kornet anti-tank missiles. As a result of sustained Egyptian pressures, Hamas eventually reversed its policy and relations between the two sides improved. Hamas security delegations visited Cairo in March 2016 and throughout 2017. In June 2017, Hamas constructed a 12-kilometre long, 100-metre-wide buffer zone equipped with security cameras and observation towers. But Egypt realised that it could expect no more from Hamas than temporary arrangements, and it has to be wary that Hamas could act as a kind of double-agent when dealing with Islamist and militant organisations. - Eliminating terrorist activity in the Rafah-Sheikh Zuweid-Arish triangle. - The destruction of smuggling tunnels. - The creation of a five-kilometre-deep buffer zone on the Egyptian side of the border. Egypt pressed ahead to accomplish all three objectives. As for the Egyptian border with Israel, in spite of political, social and security upheavals in the region over the past years, Egypt remained committed to its border security arrangements with Israel. In fact, mounting security challenges affecting border zones on both sides led to closer levels of cooperation that enabled the two sides to counter growing terrorist activity during that precarious phase from January 2011 to the end of 2013, which was when Israel completed the construction of its electronic border fence with Egypt. Given the challenges at the Egyptian border with Israel/Gaza, it has been necessary to combine security approaches with a functional approach in border management. In theory, according to the functional approach, border policy can range between “closed” and “open”. Since 11 September 2001, most countries have adopted a dynamic policy in this regard. They strike a delicate balance between cross-border cooperation and integration, and keeping out undesirables: persons who could pose a security threat or become a social and economic burden. Another approach is to swing between open and closed borders. But this is a cyclical process the means and infrastructure for which is unsustainable. As for the conventional approach to border security, it calls for the highest possible degree of control over cross-border movement. Perhaps the measures the Egyptian government has implemented since October 2014, which involve creating and expanding the buffer zone along the border with Gaza, are the most concrete translation of this approach. - Safeguarding the unity of the political fate of Gaza and the West Bank. 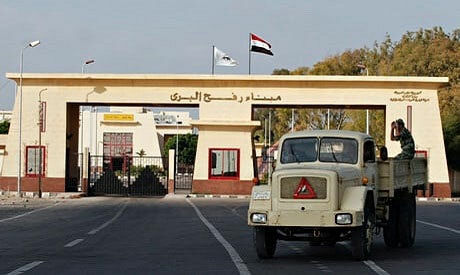 - Tightening control over security in Sinai. - Preserving the peace with Israel while working to advance the Israeli-Palestinian peace process. - Maintaining Egypt’s position as the dominant regional influence in Gaza. The “flexible borders” policy that Egypt adopted with regard to its border with Gaza was designed to realise these aims. The shifts between closed and open borders were calibrated so as to assert a maximum degree of pressure on Hamas to compel it to make concessions in the Palestinian reconciliation process while simultaneously furnishing a safety valve, especially for humanitarian purposes. The latter required striking a formula for working with Hamas authorities. However, Cairo’s positive interaction with them remains contingent on their commitment to border security, to halting cooperation between some Hamas militia members and the Sinai Province organisation, and to the Palestinian reconciliation process. Two recent developments generated dynamics that have posed a major challenge to Egypt’s northeast border policy. The first is the change in the US and European approach towards Gaza as manifested in the 13 March summit in Washington to discuss the situation in Gaza in the absence of any representation of the Palestinian Authority. The meeting was followed by an EU foreign ministers meeting on 16 April in which the situation in Gaza topped the agenda. The trend appears geared to internationally “legitimising” the separation between the West Bank and Gaza and Hamas’s control over Gaza. The effect will be to limit pressure on Hamas to strike Palestinian reconciliation and inducing Hamas to attempt to “barter” with Egypt over the price Cairo would be willing to pay to sustain its dominant influence in Gaza compared to that of rivals such as Qatar, Iran and Turkey. The second development has to do with uncertainty surrounding Palestinian President Mahmoud Abbas and the question of succession. A power struggle could be extremely costly in light of reports of militias stockpiling arms in refugee camps and towns in the West Bank. Hamas stands to gain in the immediate post-Abbas period, regardless of succession scenarios. These two developments have given rise to a point of view that holds that now is the best time to up the pressure on Hamas in order to obtain concessions needed to end its exclusive control over Gaza and to secure Egypt’s vital interests.